After having a week of featuring artistic images of death, sin, and hell, I figured I would look for the prettiest image that I could for heaven to celebrate All Saints Day! So, I looked, and looked and looked and… you know what? Corrado Giaquinto does absolutely lovely images of Heaven, don’t you agree?! Look at this one! 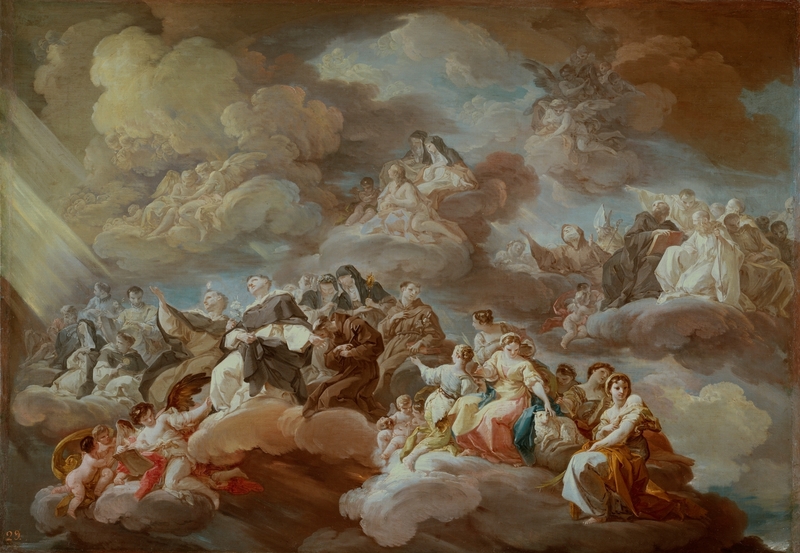 The Paradise, by Corrado Giaquinto, c. 1754-57. Museo del Prado, Madrid, Spain. I really like this particular image because it shows such a multitude of people. There are plenty of religious orders recognized in this picture, which makes sense because many of the saints who we venerate and recognize as being saints were religious in their time here on earth. But there are also those who look to be fairly common people as well, and everyone seems to be glad to be with each other! And everyone seems to live in a beautiful sunset where there is only beauty and nothing else. Which, I don’t know about you, but I’ve always loved gorgeous sunsets like this! There seems to be a peace in the air when the sky is exploding in these gorgeous pastel colors. And to be a place like that constantly? Sign me up! Of course! We don’t really know what heaven will look like. As the scripture says, “Eye has not seen, ear has not heard.” So, while this looks like paradise to me, I am certain that heaven will be even better than I could possibly imagine. And honestly? That’s fine with me! So, my fellow brothers and sisters! Let us petition the saints to pray for us as we follow Christ! And may our eyes turn toward heaven and our thoughts toward God! Thank You for preparing a room in heaven for us! May we triumphantly do Your work on earth while we’re here so that we can join You someday in Paradise! If you’re interested in more artwork where Heaven meets earth, you should check out the book that I’m about to publish about the Joyful Mysteries!